What could possibly be more comforting than homemade herb buttermilk biscuits. Honestly. Every grandparent has their version of their ultimate recipe that they have passed down to their kids. We all crave the buttery flavour and flakey layers smothered in fresh jam or drowning in gravy. This recipe is no different, except for the fact it is my favourite. I have a lovely chef friend named Grayson. He is literally an encyclopaedia of knowledge for every cooking or baking hack known to man. I walk into his store and hit him with a random question and viola, this man has the answer. My favourite answer from him so far is his butter tip. Basically, whenever you are baking or cooking with anything that requires you to “taste” the butter in the dish, use a high fat European butter. At least 82% fat. This tip has changed the flavour of my pastry dough, my shortbread, and my biscuits. For the better. 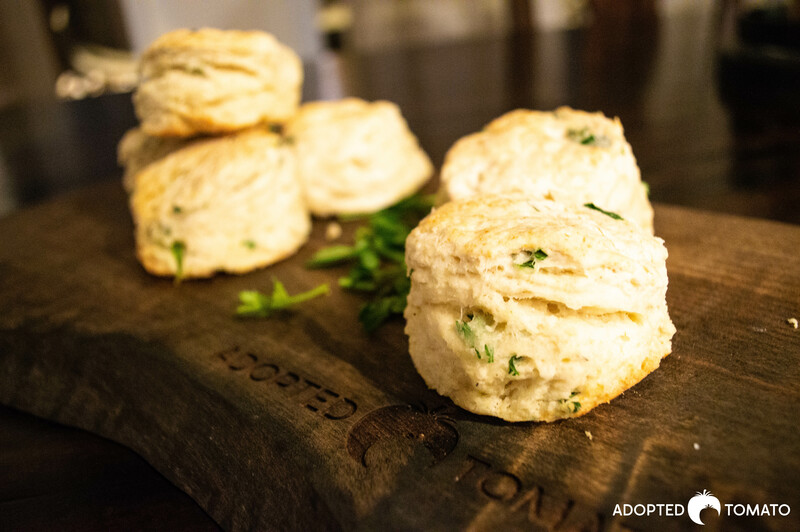 This herb buttermilk biscuit recipe is easy. It takes very little time to prepare and never fails to produce beautiful, buttery biscuits every single time. The best way to cook them is in a 8×8 square pan. They enjoy being nestled beside each other and I find they cook the best when tucked in tight quarters. Using fresh garden herbs such as sage, thyme, rosemary, chives or parsley, will subtly change the flavour to match whatever dish it is your serving. 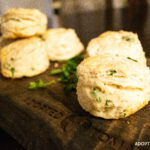 Furthermore, if you really want to make these herb buttermilk biscuits savoury, add some crisp bacon, cooked ham, grated cheddar, or sharp parmesan cheese with a pinch of paprika and pepper. These biscuits freeze really well too. Simply place them in a freezer bag and store for up to a month. Defrost on the counter and warm up in the microwave or oven. In a large mixing bowl, add the flour, baking powder, baking soda, and salt. Using your fingers, add the butter and quickly work it into the flour until if forms a crumbly mixture. Add the herbs and the buttermilk and combine to form a soft dough. Do not knead this dough as you don’t want to work it too much. Rather, you want it to gently come together. Roll the dough on a floured surface and using a rolling pin, roll to about 1/2 inch thickness. Using a cookie cutter approximately 2″ wide, cut the biscuits out and place in a greased 8×8 square pan. Bake for 12-15 minutes until the biscuits are golden brown on top. Serve warm with butter along side your favourite soup or stew.